There is a selfie stick and tripod for photography of different distance. The phone holder can rotate 360 degree for perfect photography, travel essential. Made of high-quality material, lightweight and portable, very easy to store and corrosion resistant. Anti-slip mini pads on the phone holder&apos;s clamp guarantees firm holding performance for mobile phone. Used for your family reunion, friends gathering, graduation, company party, travel and so on. 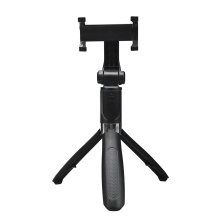 The clamp can be rotate full 360° for capturing picture from horizontally or vertically. Covered by soft silicone interior to protect your phone from scratching.